In the scientific article recently published in Scandinavian Journal of Child and Adolescent Psychiatry and Psychology, Erica Ramstad and others reviewed the existing evidence between various psychotic symptoms such as hallucinations, problems with concentration or anxiety with methylphenidate, a drug commonly prescribed as a treatment for attention deficit hyperactivity disorder (ADHD) and narcolepsy. Methylphenidate is a stimulant that increases the activity of the central nervous system, helps to combat fatigue, improves attention and maintains alertness. Its medial use medical use began in 1960 and continues to grow since, reaching global consumption of 2.4 billion doses in 2013. Clinical studies confirmed safety and effectiveness of the drug and proved that its long-term usage reduces abnormalities in brain structure and function usually associated with ADHD syndrome. Currently around around 5.3% children and adolescents worldwide suffer from ADHD condition. Psychostimulants, including methylphenidate, are first-choice drug treatment. Ramstad and others examined whether methylphenidate increases the risk of psychotic symptoms in children and adolescents affected with the illness. 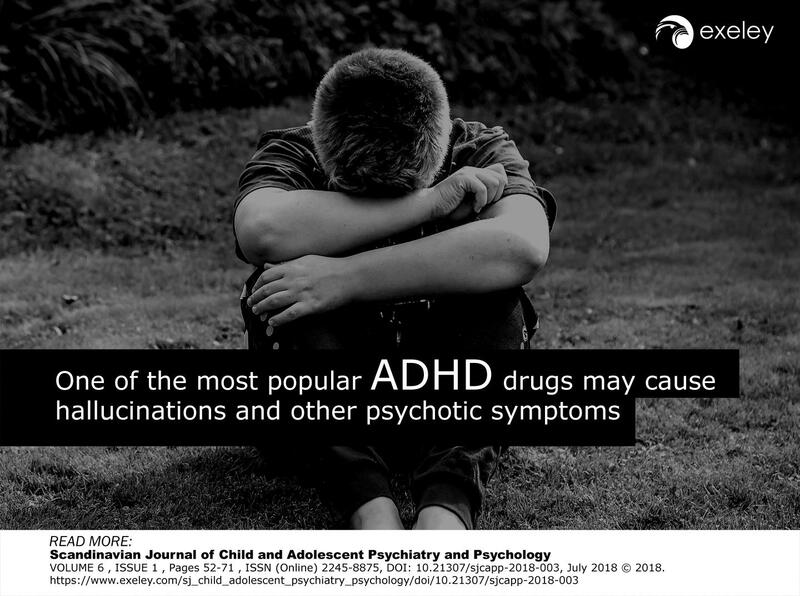 Although the amount and quality of existing data did not allow them to draw any strong conclusions, their research suggests that possible adverse symptoms may affect around 1.1% to 2.5% of ADHD patients treated with methylphenidate. The article and its findings are of great importance for patients, physicians and caregivers who should be aware of possible adverse effects of the drug. In case of appearance of psychotic symptoms during the methylphenidate medication, clinicians should be able to address the problem, reduce or stop stimulant medication and ensure proper treatment. The Scandinavian Journal of Child and Adolescent Psychiatry and Psychology (SJCAPP) is an Open Access, scientific journal covering a broad scope of high value articles in the field of child and adolescent psychiatry and psychology. The journal publishes quantitative and qualitative research on: diagnosis, assessment, psychotherapeutic and psychopharmacological treatments, behaviour, cognition, epidemiology, development, training, cross cultural issues, neuroscience and genetic aspects related to mental disorders in children, adolescents and families. Exeley Inc. is a New York based company that focuses on offering innovative publishing services to Open Access publications worldwide. Amongst the technological solutions delivered, the functionalities include responsive webpage design, full-text XML, integration with social media sites and performance metrics including altmetrics.